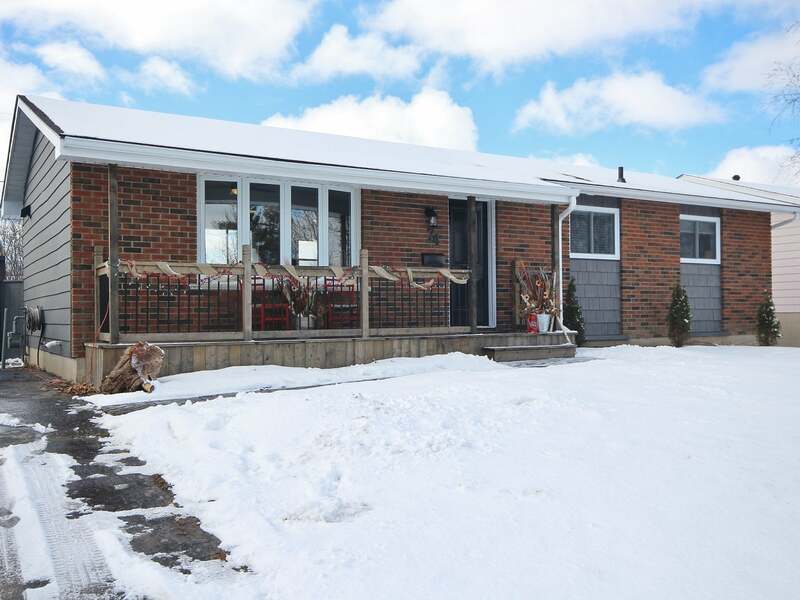 Absolutely stunning 3 bedroom bungalow with 66ft wide lot on a quiet mature street in Amherstview. Extensively renovated featuring hardwood and tile flooring throughout the main floor, custom kitchen with crown mouldings, glass insert, tile backsplash, extended breakfast bar and stainless canopy range hood. Gorgeous 4-piece bathroom with deep soaker tub and tiled walls. Hardwood stairs lead to fully finished lower level with laminate floors, pot lighting and lots of large bright windows plus 2-piece bathroom with additional bonus room/laundry room. Fully fenced rear yard with deck, shed and patio. Updates include: gas furnace, central air, roof shingles, windows, front/rear decks, facia & soffit, light fixtures, plumbing, electrical, doors, trim & baseboards, stairs & railings and insulation! All this plus 5 appliances included and so much more! Ideally located within short walk to 3 schools, parks, rec centre and more! You won’t be disappointed, call to arrange a private viewing.